Just a quick reminder that we are currently living in the last days on Earth. 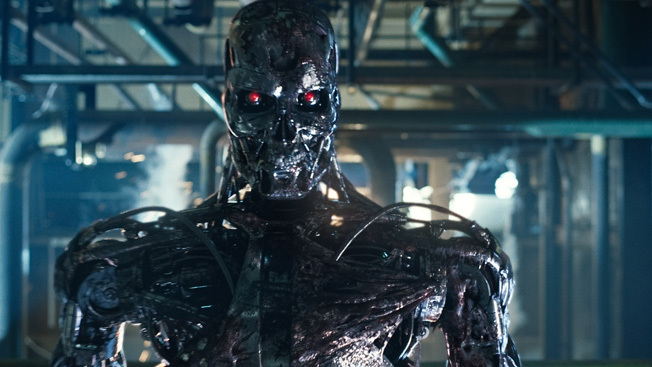 According to the timeline of Terminator's The Sarah Conner Chronicles, Skynet went live this week at 8.11pm April 19th, 2011, and Judgement Day is today (April 21st). I am personally yet to notice any changes, but that's okay. Being in New Zealand we're often the last place to find out anything, yet I imagine North America is already well under siege. While I welcome any resistance who may be reading this an opportunity to hop in any salvageable sea worthy vessel and row this way, I'm going to go out and enjoy my last moments speaking my mind, with a bottle of J.D's and a fat cuban cigar... starting with my boss. i knew i should have stayed in bed today. the needless suffering of so many who observe Passover every year could have been saved a lot of suffering at the dinner table had Judgment Day come just a few days sooner. Haha! Great post. South Africa still same as usual here. Love your blog. Glad you guys all liked the post! And welcome to IDAW John - thanks for commenting and glad you are liking what you find!